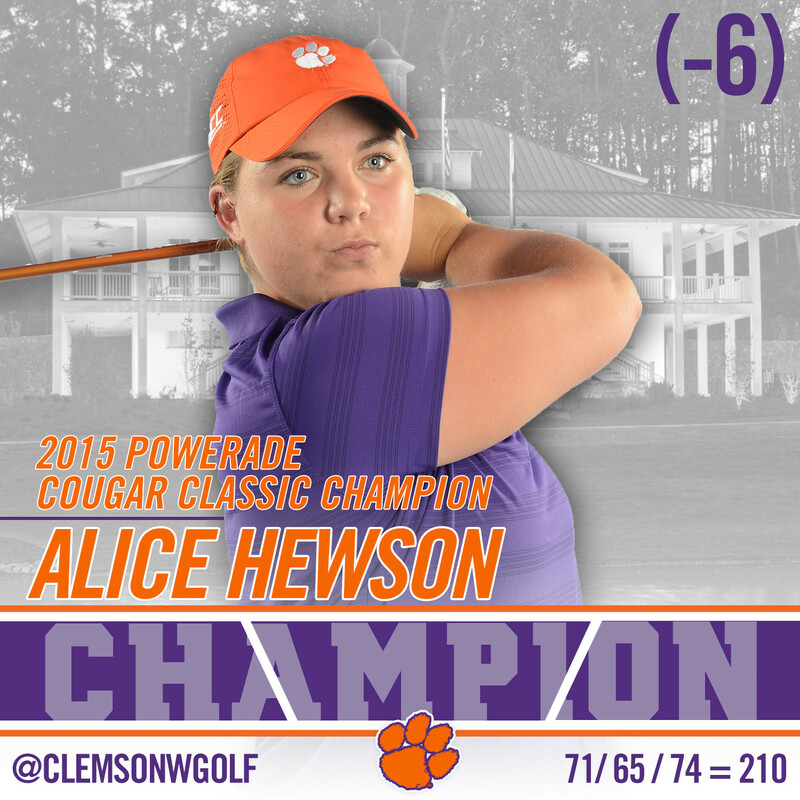 Clemson, S.C.—Freshman Alice Hewson took co-medalist honors to lead Clemson to a fifth-place finish out of 20 teams at the Powerade Cougar Classic at Yeamans Hall in Hanahan, S.C. on Tuesday. It was the season opening tournament for the Tigers, who will play this weekend, September 18-20 at the Furman Invitational in Greenville, S.C.
Clemson shot a three-over-par 291 team score on Tuesday after rounds of 297 and 290 the previous two days, to finish with a 878 team score, 14-over-par. Arkansas, ranked eighth in the nation according to Golfweek, finished first at 857, seven shots better than Georgia. Virginia, ranked 16th in the nation, finished third at 865, while Florida was fourth at 869. Clemson was fifth at 878, 11 shots ahead of 14th ranked Wake Forest. Clemson also finished higher in the standings than 17th-ranked Mississippi State (904) and ACC teams N.C. State (892), and North Carolina (897). Hewson shot a 74 on Tuesday to finish with a 54-hole score of 210, six-under par. She tied Taylor Tomlinson of the University of Florida, who also shot a 74 on Tuesday to finish at 210. 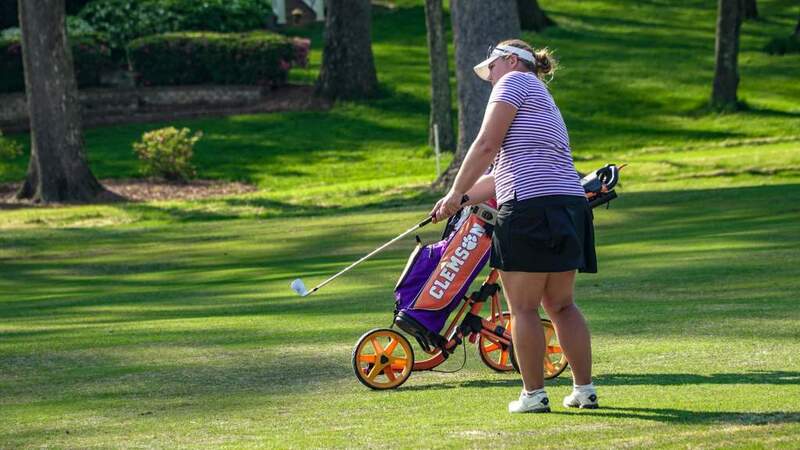 Playing in the first tournament of her Clemson career, Hewson had rounds of 71-65-74 and became the first Clemson women’s golfer to win a tournament in her first career event. Ashlan Ramsey and current teammate Sloan Shanahan both finished second at the same Cougar Classic two years ago in their first career tournaments. Ramsey then went on to win in her second and third career events. Hewson got off to a rough star on Tuesday as she made bogey on each of the first three holes. But she battled back to reach even par after birdies on the ninth, 10th and 13th holes. She made a pair of bogeys, then finished with two pars to tie Tomlinson, who also made pars on her last two holes. The final round was played with a shotgun start so all the teams were finishing at the same time on different holes. 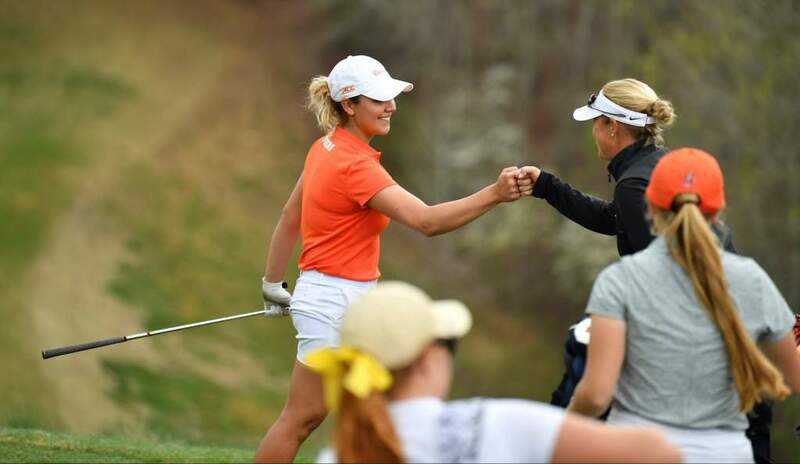 Hewson had set the Clemson single round scoring record on Monday when she made a 65 on seven birdies and no bogeys to vault into a tie for the lead with Tomlinson. 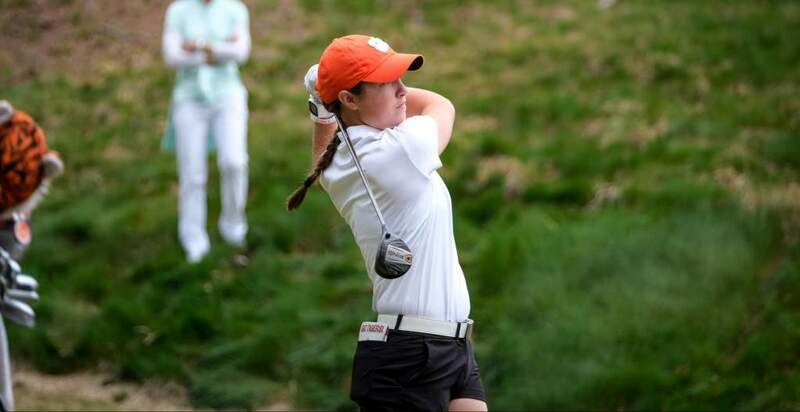 Classmate Lauren Stephenson was Clemson’s top golfer on Tuesday with a two-under-par 70. She finished in 17th place overall with a 220 score, four over par. She had a tournament best five birdies on Tuesday, including the 15th 16th and 18th holes on the course. Clemson’s second best golfer on Tuesday was junior Jessica Hoang, who had a one-over-par 73. Last year, Hoang had tied the Clemson record with a 68 at the same course with a 68. She was three-over-par through 11 holes on Tuesday, then made two birdies and five pars to close with the 73, her best score in her last 16 rounds. Marisa Messana also had a 74, giving Clemson four players at two-over-or-better for the first time in the tournament. Messana started with an 83, then recovered with consecutive rounds of 74. Sloan Shanahan was Clemson’s non-counter on Tuesday with a 79, but she had solid rounds of 74-73 to help Clemson to a fifth-place standing after two days. 1. Arkansas 857, 2. Georgia 864, 3. Virginia 865, Florida 869, 5. Clemson 878, 6. Wake Forest 889, 7. N.C. State 892, 8. Indiana 893, 9. UCF 894 and Auburn 894, 11. Furman 896, 12.North Carolina 897 and Michigan 897, 14. College of Charleston 900 and Penn State 900, 16. Mississippi State 904, 17. Wisconsin 927, 18. Charleston Southern 932, 19.Maryland 941, 20. UNC Greensboro 958. 1.Alice Hewson 210; 17. Lauren Stephenson 220, 50. Sloan Shanahan 226, 70. Marisa Messana 23, 77. Jessica Hoang 232.